Decontamination tent is made with a inflatable tent together with a decon system. With the air pump, the decon shower tent can be set up in 5-10 minute. It will not fall down for many days even you do not add any air in to the sealed air frame. It can be used when the water supply system and related accessories have been linked. The decontamination tent is a isolated system because there is a inflatable pool inside the decon shower system which can keep the polluted water away from pouring into the surroundings. 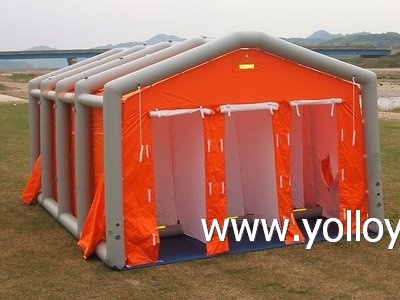 The decontamination shelter and shower system is design to be simple and easy to set up, it can can be packed in small size, so easy to transport which makes it suitable for the rescue team, fire department, hospital, army and industrial security department and so on.